The WE ARE ONE Colour Festival, South Africa’s first and original colour festival, in association with the world’s leading youth entertainment brand, MTV brings the ultimate in colourful festivities in South Africa for 2014. 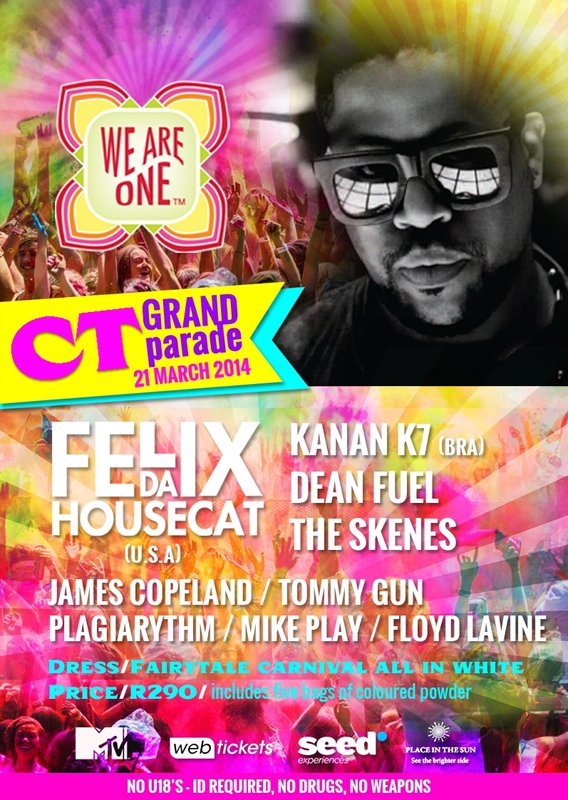 The festival takes place on Friday, 21st March (Human Right’s Day) at Cape Town’s Grand Parade and will illuminate the city with brightly coloured powder to the lively beats of a top DJ lineup. The 2013 instalment of the festival saw a sold-out crowd of WE ARE ONE Colour Festival fans enjoying a fantastic day in the sun tossing coloured powder in the air and celebrating the beauty of life! 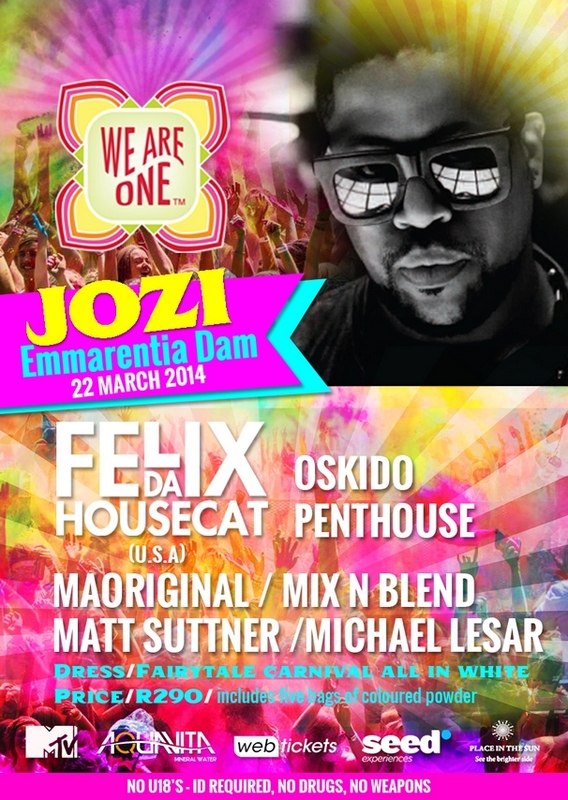 The very next day, 22 March 2014 the WE ARE ONE Colour Festival makes its way up north to the beautiful Emmarentia Dam in Johannesburg. Similar to Cape Town in 2013 the festival saw fans share the laughter and fun in amongst eight tons of brightly coloured powder. This year the festival is themed for all fans to let their imaginations run wild. “Fairytale Carnival” was the winning theme chosen by the WE ARE ONE Facebook community, so get your white outfits ready with a fairytale twist to stand out from the rest as you are showered with coloured powder from all directions. Think about what your favourite fairytale character would wear to the Mardi Gras carnival with all the beaded necklaces, extravagant hats and outrageous outfits that go along with it. The coloured powder used exclusively at the festivals is environmentally friendly and comes in an assortment of the brightest and funkiest colours to brighten up everyone and anything at the festivals. Get your ticket early to avoid any disappointment. NB: The Standard Tickets – with no coloured powder have sold out. So, get your colour on with a ticket that includes 5 bags of coloured powder to light up the sky or toss at your friends. The environmentally friendly and toxic free powder will also be sold separately on the day for R25 a bag. Get yours now and be part of the brightest and most colourful phenomenon of the year!